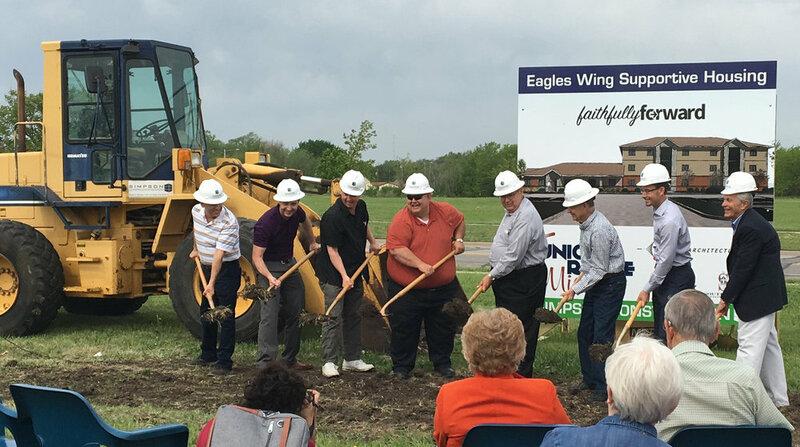 The Eagles Wing addition to the Union Rescue Mission at 2800 N. Hillside will provide transitional housing for homeless men in Wichita. Simpson Construction Services will begin construction next week on this project designed by TEAM Architecture - LLC and MKEC Engineering, Inc. It has been a great honor to work alongside the leadership of the Union Rescue Mission, Simpson Construction Services and MKEC Engineering, Inc. to bring about this project to further the effectiveness of the Union Rescue Mission and their goal of transforming the lives of homeless men in Wichita! See more of the story at the Wichita Business Journal or TEAM Architecture - LLC. It was an honor to play a role in the Kay County Free Fair centennial event! See the Blackwell Journal-Tribune story. The addition to the Udall Elementary School is progressing on schedule. See the story at The Cowley Courier Traveler. TEAM Architecture - LLC will be working with Central - Burden USD 462 to improve safety and security for the students, staff and patrons at Central High School. Projects include a new activities entrance / safe room addition, a main entrance / security remodel and improvements to the existing gymnasium. You can find more about the story at KAKE News or the Winfield Daily Courier. TEAM Architecture - LLC has been assisting Johnson Controls, Inc. with the design of their expansion in Norman, OK.
See more at The Norman Transcript. Construction is well underway on the new Auditorium Addition at Udall High School, the baseball field construction has just begun and demolition activities are in progress at Udall Elementary School in preparation for its new addition. See related photos from the Winfield Daily Courier here. TEAM Architecture - LLC is working with Udall High School to upgrade and improve their baseball and track facilities. See the related story from the The Winfield Courier. Voters rejected a $6.4 million bond proposal through mail-in ballots by a vote of 394 (no) to 229 (yes). See the Winfield Courier for the full story. Will the State of Kansas discontinue aid? Many predict the State of Kansas will discontinue school construction aid to school districts passing bond issues for facility improvements. Voters in the Central of Burden district, USD 462, must consider this question as they decide by mail-in ballot whether or not to pass a a $6.4 million bond proposal to improve their schools. The State would currently participate alongside USD 462 patrons at a rate of 49%, but many foresee a change coming after July 1. See the Prairie Star for the complete story. USD 463 of Udall voters approved a $5.96 million school bond proposal on Tuesday. The question passed by a margin of 275 to 84 according to unofficial results.